Don’t worry, this isn’t boring. How was your weekend? Mine was epic and awesome and fabulous, thanks to my sister and 3bffs who made time to take me to the beach for a pre-wedding celebration! That’s aka a bachelorette party. 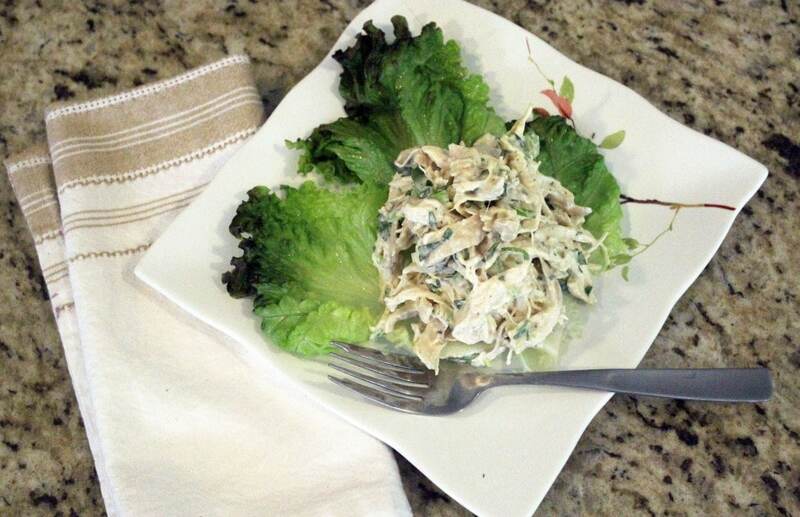 Before I left, I made a bunch of this chicken salad for Jay to eat because I believe myself to be in charge of his food intake and he really likes it so…. 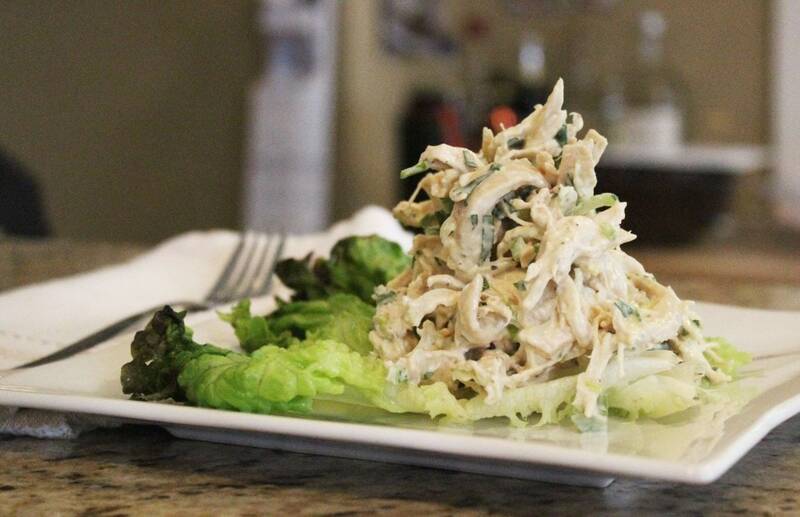 What’s not to like about a really great chicken salad? It’s so summery and comforting and delicious. I love this version, but sometimes I add sour cream, yogurt, extra veggies…anything that looks yummy! I don’t like a very creamy salad AT ALL, so I shred my chicken into pretty small bits and don’t use a ton of mayo. You can add more though, to your liking! ALSO, for folks that are really sensitive to mayo flavor but like creamy things, a spritz of lemon juice adds a nice tang to offset any offensively eggy flavor. 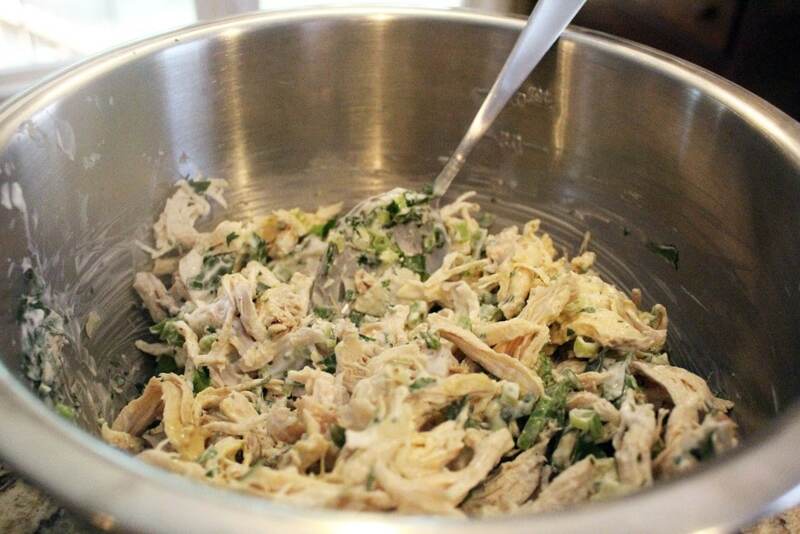 You need shredded, cooked chicken, salt/pepper, celery, scallion (or just a bit of onion will be fine), mayo, dijon mustard, and parsley. For the chicken, I poached it just like I did in these chicken and noodles, then I saved the stock/cooking water for another use. When the chicken had cooled I shredded it with my fingers. I like doing this sometimes on a weekend day with a LOT of chicken, then using it all week for whatever dinners I throw together. Just a thought – take it or leave it. To “make” this salad, you, um, stir everything together. Duh. 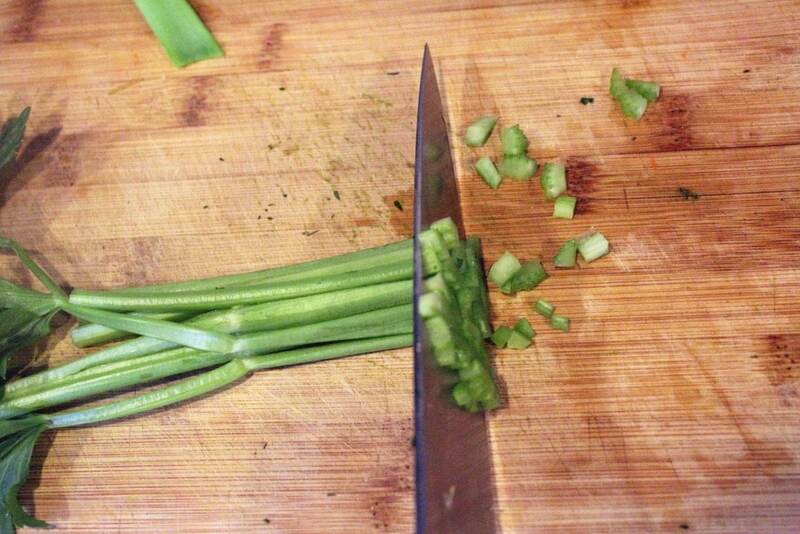 I like to chop the celery, parsley, and onion really finely. Don’t worry if you don’t have a scallion, just use a 2-inch piece of onion and grate or chop it. It’ll be delicious! 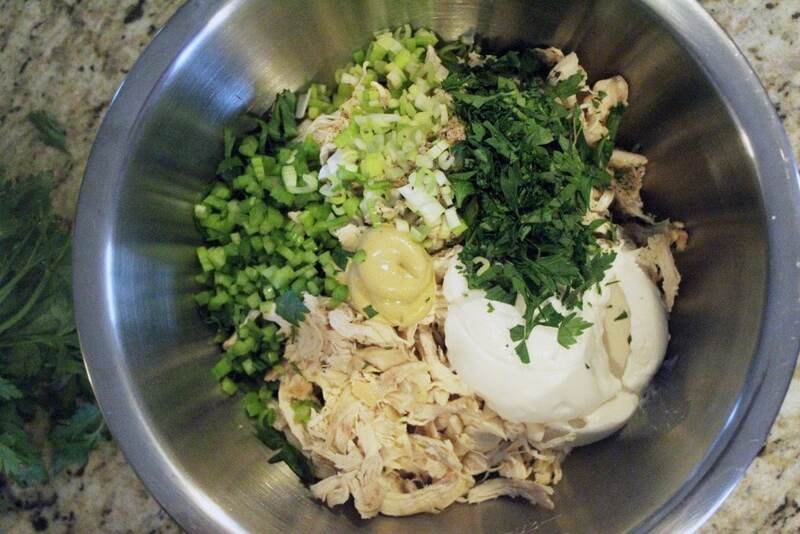 Then, add all the ingredients to a large bowl with the chicken. And stir everything together! If you’d like a creamier salad, add some more mayo. Need more tang? Add another squirt of mustard. Add salt and pepper to your taste, too, and you’re ready to go! 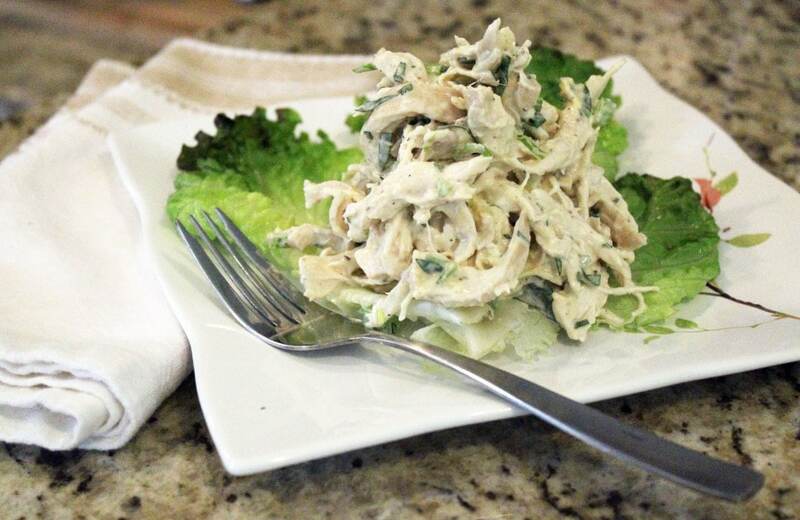 This can sit in the fridge for several days for snacks, salads, even a quick dinner with a baked potato and steamed broccoli! We love this, and I hope you will too! It’s fun for parties on little sandwiches, or even slider rolls or biscuits would be adorable! I like it plain over lettuce or a tossed salad, though. Great for dinner or lunch. Hint: If you’re worried about this getting nasty in the sun at a potluck (some rule about not leaving mayo-based stuff out for more than 90 minutes or so? I don’t follow it), vegan mayo or yogurt/sour cream work great in this too and add nice flavor. Don’t stress. Combine all ingredients in a large bowl. 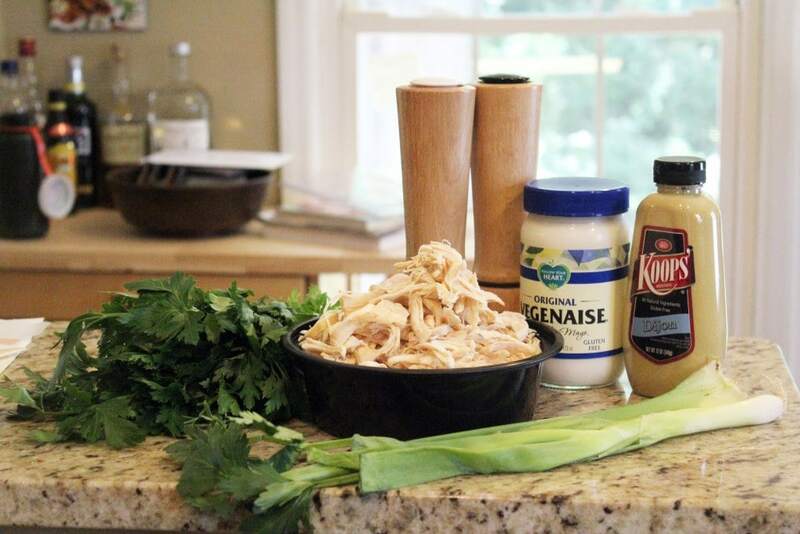 Add more mayo and mustard to your taste if you'd like a creamier salad. Taste, and add as much salt and pepper as you'd like. Serve with crackers, over a salad, or on bread for a sandwich. Enjoy! Submitted to weekend potluck – my favorite drool-worthy Friday-morning activity!